The Fat Prophets Global Property Fund (the Fund) had a strong month in November with NTA rising from $1.059 to $1.0857 reflecting an increase of 2.5% over the month. This is a pleasing result given the Fund started the month only 18.5% invested with the balance held in cash at that time. November was a very active month for investment of the cash from the IPO, and as at 31 November the portfolio was substantially increased to 85% invested, leaving cash levels inside the 15% mandate range. Further investments since that time have lowered cash further into the single digit range and have resulted in the portfolio being effectively fully invested as expected within 60 days of IPO. While initial investments were primarily made in Australia and the US during October, the investment process rolled more broadly across the international landscape in November. A number of investment positions have already realised double digit gains, and the portfolio has benefitted from a positive currency position during the month. There has been little trading undertaken although our sole New Zealand investment (Ryman Healthcare Limited) was closed out after a double digit price increase within weeks of investment. With the Fund also focussing on providing a sustainable distribution yield to its investors, an investment focus for December has related to pending half yearly distribution ex dates of positions held in the Fund which will seed income for future distribution to Fund investors. The Fund holds investment positions in two REITs which have been subject to takeover bids. Both of these are shopping centre REITs and in the Investment Managers view this validates the overweight strategy of owning oversold shopping centre REITs. Of the two REIT takeovers, one (Intu Properties in the UK – INTU.L) was the subject of an agreed and board recommended takeover offer from Hammerson at a 28% premium, to create a €21Bn combined UK/European property portfolio. The second proposal was from Brookfield to acquire $22bn US REIT GGP Inc at a 21% premium, which has subsequently been rejected by GGP with takeover discussions continuing. 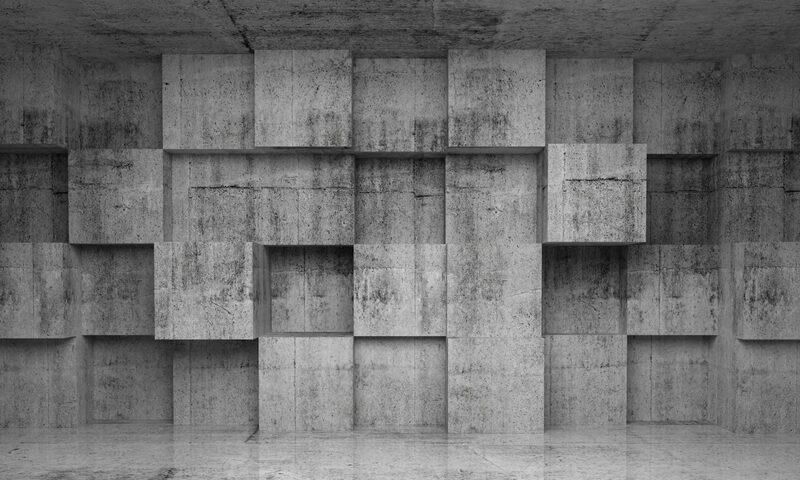 Thematically the Fund is invested strongly in shopping centre REITs, and storage REITs in global markets. 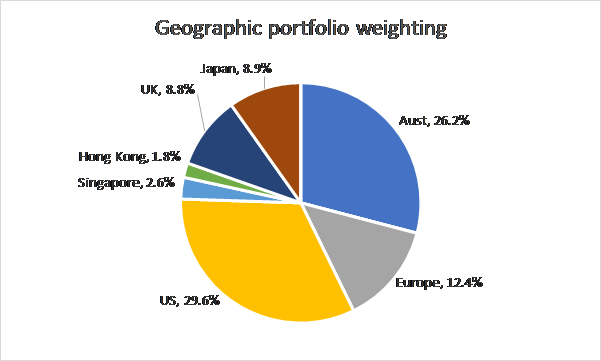 Regionally, the Fund is underweight the US, overweight UK and Europe, and is overweight Japan while being neutral Asia and underweight Hong Kong. The Fund is market weighted toward Australia. The Fund holds around 50 investment positions. 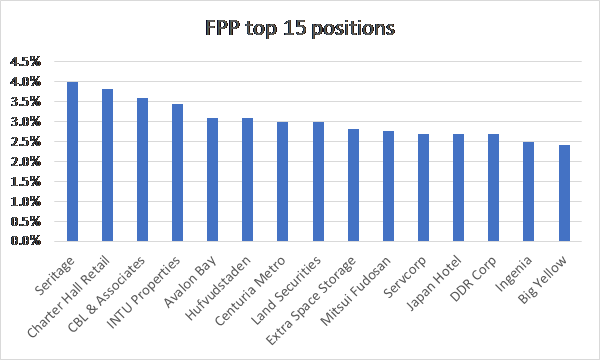 The top 15 positions are highlighted in the following chart and demonstrate an overweight to shopping centre REITs. The top positions reflect a diversified mix of investments across US, Australia, Europe and UK. Currency made a small positive contribution to return for the portfolio during November. The underperforming US investment positions above reflect weak investor support for retail thematics in the US and we believe this continues to offer a significant opportunity of owning high yield stocks at significantly below their fundamental value. The overall strong movement in NTA as the portfolio has been established is a pleasing start to the Fund and the momentum has continued into early December. We anticipate a relatively low level of portfolio turnover as the initial investment positions consolidate their expected gains into the new year.